My ears are ringing. That’s a good thing. It was an amazing time and seeing our weeks of hard work pay off was so satisfying. So many thoughts and observations from that night. I can only break it up in sections to avoid babbling. The Missfits of Mayhem… Wow what an amazing bunch of women. Watching them skate and work together was inspiring. Not so inspiring when they knocked me around… and I got some doozies! And their jammers; amazing! Each and every one of them! They were aggressive and smart. I thought I had some moves, but so did they! An honour to skate with them. And your intro… Epic!!!! Wow! Wow! Wow! Did we ever pull it together! After a chaotic 10 minutes and heavy penalties, we were floundering. But we pulled it together after the half and got our heads together. My blockers were amazing! There were times when I needed help and they were there. Other times all they did was saw me coming and they cleared a path. There were times I went through without getting touched. Plus our bench coaches were amazing and the rest followed suit! 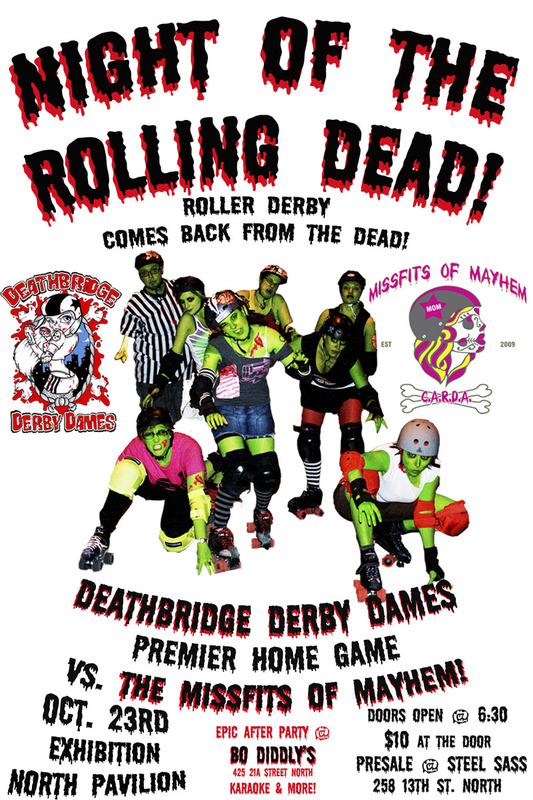 An honour to play with each and every one of the Deathbridge Derby Dames! 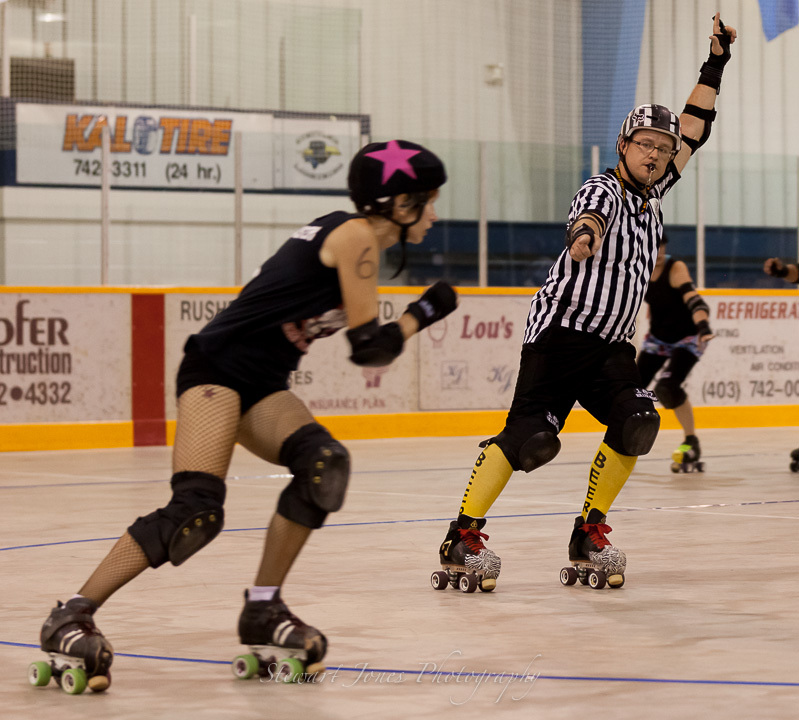 The calibre of our guest refs, NSO’s, timekeepers, our announcer, technical crew… You kept the game going, fair and fun! And for the record, the best/raunchiest names in the business! Special congrats to our own ref, Jeremesiah, who ref’d his very first game! I can’t wait to see our up and coming refs to join him! They were current members, fresh meat and friends and family! Their enthusiasm was crazy! And fun! They were the first contact our fans had with us and they rocked it! Special thanks to Betty Believeit for putting out fires all over the place & creating backup plans in case of emergency, while juggling all the volunteers. You rock my world Betty! Wow wow wow wow wow wow! The response was amazing! Our first guess is over 600 in attendance. I can’t wait to know the number for reals! Many I talked to had fun and even caught on to the strategy of the game! We were so happy to have you in the stands cheering both teams on! To my friends and family who came out to support us; from the bottom of my heart, thank you! Post game, all hits and penalties get left on the track and both teams go and do it up, beer style. For those who attended and got to witness penalty wheel debauchery got an eyefull of fun! Best party I’ve been to in I-can’t-remember-when. It was great to chat up the Missfits and have good times with them. I was truly torn in choosing when to go home; I was exhausted and sore but having so much fun. I’m sure there’s more I could say, but I don’t want to mess up this post by using too many words. If you were there I hope everyone could feel the love… I had it for everybody! Tomorrow we’re back at practice and I’m looking forward to expanding on my skills with my crew now that we our first game as a team under our fishnets. I’m also excited that tomorrow is fresh meat night and I hope we get a big crew of newbies to come out. I hope to post some Photos, maybe some video and maybe some more thoughts in the next few days. Stay tuned dear readers! I’ve had a rough couple weeks. Battling a persistent sickness while trying to get ready for our debut bout in Lethbridge is stressing me out in a very big way. Every spare minute of my time these last couple weeks have been filled with board meetings, bout meetings and committee meetings to get ready for this. Our arsenal of 8 or so gals who are championing this cause are getting run off their feet. My lunch and coffee breaks at work are spent emailing, twittering, phoning, postering, contacting media, designing programs and whatever else gets thrown at me. On top of that, practices are becoming more intense; talking strategy and bout procedure. It’s been a lot of information to process. Then a week and a half ago, the sickness hit. Juggling everything on top of having an extremely fuzzy head has been tough. A bad fall at practice with my wrist guard getting pinned between the floor my phlegm-filled lung made for a scary couple minutes of having trouble breathing. The bout is just over a week away and I’m still hacking and coughing. My participation at practice has been 50% at best. The extra skates I do in between practice have been non-existent; I’m worried about my stamina. I shared with another Dame my stress of thinking so much about the planning and everything that has to be done leading up to the bout, I’ve had little time to get my head into the game and prepare for the actual bout. I’m so nervous about my lack of preparation and performing in front of my friends, family and the home crowd that I’m afraid I won’t perform at all. The last thing I want to do is disappoint myself or anyone else who came out to see me play. I’m doubting my derby skills in a big way right now. Yes readers, I’m getting my whine on a little bit (squeaky wheel, get it?). But when all things are considered we have lots to be proud of; the biggest being we’re not even a year old and hosting an ambitious event. P.S. If you missed it myself and some other gals were featured on Shaw TV Lethbridge a couple weeks ago. Go us again!!! Projects are filling up my todo list faster than a spinning wheel on fresh blacktop which is pushing my blog to a lower priority than I’d like. However I wanted to give a wave the general direction of some new subscribers and new commenters on these hallowed derby pages. Thanks for reading! Thanks for commenting! I have some new posts planned and a guest blogger waiting in the wings as well! Please be patient and if you haven’t already, subscribe to get handy dandy email notifications when I actually do post something! Talk to you soon! Derby Love to you all!